The Convent and Church of the SS. Annunziata was built in 1250, on the site of the ancient oratory, by one of the seven original founders of the order. At that period this quarter of Florence was outside the third circuit of walls, and was known as Cafaggio, Campo di Faggio – Field of Beech. The convent has nothing remarkable in its structure; but the church, altered and embellished at different periods, is handsome and very richly decorated. The entrance was originally towards the north. The atrium or portico of the church faces the piazza, and is composed of seven arches, raised on slender Corinthian columns. The central arch was erected by Leo X., after a design by Antonio di San Gallo, and in 1512 it was decorated with a fresco representing Faith, Hope, and Charity, by Jacopo Carucci da Pontormo (1493-1588); but of which unfortunately little now remains. Pontormo was only nineteen years of age when he executed this fresco; and Michael Angelo esteemed the work so highly, that he declared, "If the youth continued in this path he would raise painting to the skies." There are three doors under the portico; that to the left opens on the cloister and leads to the convent; to the right is the entrance to the Chapel of the Pucci family, dedicated to San Sebastiano. It was founded about the year 1300, and was adorned with frescos by Pocetti, in the seventeenth century. 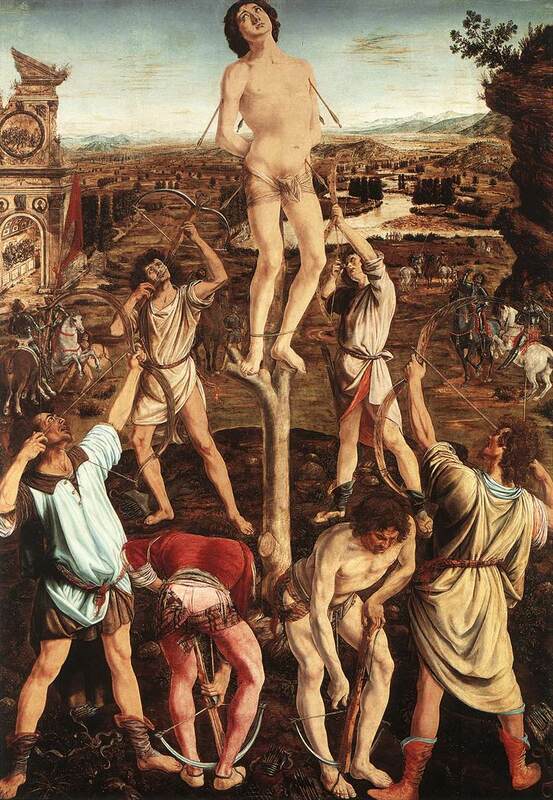 It formerly contained an altarpiece – the martyrdom of St. Sebastian, by Antonio Pollajuolo (1426-1498), which is now in the National Gallery of London, as it was sold by the Marchese Pucci in 1857. The picture is one of Pollajuolo's most celebrated works. 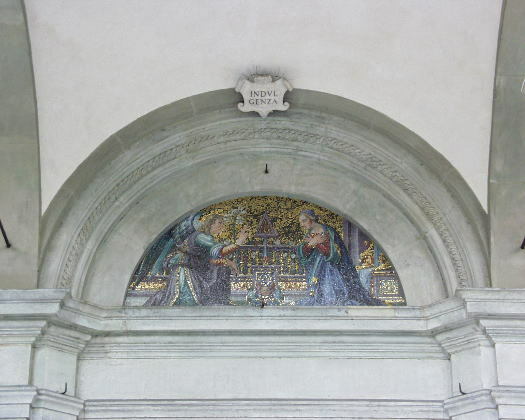 The central door under the portico opens on the cortile, or court of entrance; over this door is a lunette, containing a mosaic of the Annunciation, by David Ghirlandaio, who, inferior to his brother Domenico in painting, excelled him as a mosaicist. Next this fresco is the Life and Miracles of San Filippo Benizzi, by Cosimo Rosselli and Andrea del Sarto, in six compartments, preserved beneath glass. This saint joined the Servites in 1247, fifteen years after the foundation of the order; he had begun life as a physician, and had studied in Padua and at Paris, before he returned to Florence to practise his art. In obedience to a vision which appeared to him whilst attending mass in the Chapel of the SS. Annunziata, he resolved to abandon the world, and he retired to Monte Senario, where he became distinguished as a preacher, and ultimately rose to be General of the order; he died in 1285. Leo X. granted him the title of beato220 in 1516, but he was not formally canonized until 1671. It was on the occasion of his beatification that this cortile was decorated with frescos. The first of this series was painted by Cosimo Rosselli (1439-1506? ), and represents the saint assuming the habit of the order. It is not a picture of superlative merit, nor even the best specimen of the master. The five other compartments, representing the miracles of San Filippo Benizzi, are by Andrea del Sarto, and painted after 1548. Vasari relates that the sacristan of the convent, one Fra Mariano, when he engaged Andrea's services, ingeniously contrived, by rousing his jealousy of his brother-artist Franciabigio, to get as much as possible from him at the smallest remuneration. The first fresco by Andrea del Sarto represents San Filippo, on his road to the Papal Court at Viterbo, dividing his cloak with a leper. Next to this is one of the best of the series, - the saint, with three of the brethren, is on his way to Monte Senario, and is persecuted by the insults and gibes of a party of loose fellows; a storm arises, and these men take refuge under a tree, where they are killed by the lightning, while San Filippo and his companions pull their cowls over their heads, and quietly pursue their way. This fresco exhibits Andrea's versatility in composition, as well as his skill in landscape. In the fourth fresco, San Filippo heals a woman possessed with a demon; the incident is rendered with simplicity, the interest of the spectators is well-sustained, and there is neither coarseness nor exaggeration in the attitude and expression of the afflicted person. These three frescos were the first Andrea executed, and excited so much admiration that he was at once ordered to commence the two last of the series, - the Miracle performed on the death of San Filippo, and children healed of disease by touching his garments. In the first, a friar leans over the dead body, while groups of spectators are gathered together on either side, in the foreground; the priests in the background suspend their chant in astonishment, as they witness the miracle: a child is lying dead on the floor, but, revived by the touch of the saint's bier, he rises to life. The other fresco, in which children are brought by their parents to touch the garments of San Filippo, is remarkably well composed. A priest at the altar lays the clothes on the head of a child, who stands meekly beside his mother; to the left a cripple receives charity; to the right an aged man approaches, leaning on his staff, supposed to be the portrait of Andrea della Robbia, personally known to Andrea del Sarto, and father of the more celebrated Luca.221 An admirable bust of Andrea del Sarto, in the center of the arcade, is by Raffaelle da Montelupo, a pupil of Michael Angelo, and is placed over his grave. 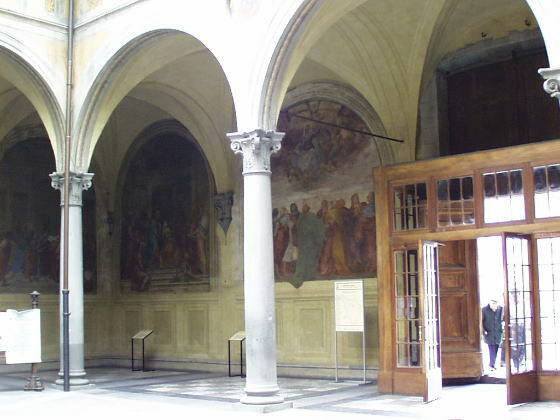 The opposite side of the cortile, also protected by glass, contains two other frescos by Andrea del Sarto, one by Franciabigio, another by Jacopo da Pontormo, and the last by Il Rosso Fiorentino. The Visit of the Magi, and the Birth of the Virgin, are by Andrea. The former was intended for a continuation of Baldovinetti's Nativity. In the foreground, among followers of the kings, Andrea has introduced several portraits. To the right, the figure facing the spectator is the sculptor, Jacopo Sansovino; the head nearly in profile is the musician, Françesco Ajolle; the figure in front pointing outwards is Andrea himself. The Nativity of the Virgin is one of Andrea's finest compositions. The picture is divided into two groups, of which Joachim, who sits meditating, forms the connecting link; St. Anne is the centre of attraction in the group to the right, the infant Virgin in that to the left. The females in attendance are singularly graceful and dignified. When Jacopo da Empoli, about 1570, some years after the death of Andrea, was copying this fresco, an old lady who was on her way to mass paused beside his easel, and pointing to the central figure, informed him, that was the portrait of the painter's wife. After conversing with Jacopo some little time, she acknowledged herself to be Lucretia, the beautiful widow of a hatter, whom Andrea married, and who became the torment of his life. The Marriage of the Virgin is by Françesco di Cristofano, better known as Franciabigio (1482-1525), a pupil of Albertinelli, and friend of Andrea del Sarto. He painted this fresco in 1513. The High Priest marries Joseph and Mary before a noble palace, covered with reliefs of Scripture subjects. The despair of the unsuccessful suitors is well represented. Franciabigio had nearly finished his painting on the eve of a great festival of the Church, some touches were still wanting, when the monks, impatient to display the work, removed the screens. The wrath of the artist knew no bounds; he hastened to the convent, and, seizing a hammer, nearly obliterated the heads of the Virgin and of several other persons, to the great amusement of his companions, none of whom could be persuaded to restore what the master had destroyed. 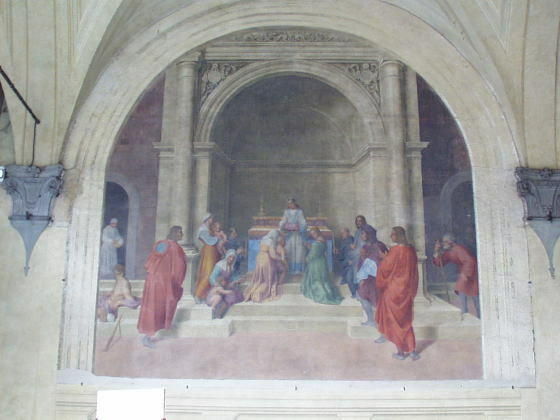 To this day the fresco, although the best work of Franciabigio, has remained in the condition in which he left it. The adjoining fresco, the Visitation of Elizabeth to Mary, is by Jacopo da Pontormo, the pupil of Andrea del Sarto, who executed it in 1516. Vasari praises the work, and says that Pontormo painted it in a new manner, and was especially successful in the flesh, referring particularly to the boy seated on the steps. The Assumption of the virgin, the last of the series in the cortile, is by Il Rosso Fiorentino (1496-1541), who painted it in 1513, when only seventeen years of age. Il Rosso afterwards visited Rome and Venice, and proceeded to France, where he painted for Francis I., and was appointed by that monarch superintendant of the works at Fontainebleau. The Madonna is surrounded in the heavens by a crowd of angels; the Apostles stand below; St. James, who wears the dress of a pilgrim, is the portrait of Françesco Berni, the satirist; and the smile Franciabigio has given to him is probably in allusion to the style of comic poetry which he invented and which has been called after him Bernesca. The Church of the SS. Annunziata is composed of a single nave, with five chapels on either side, two short transepts, and a circular choir, surmounted by a cupola. The whole is richly decorated with paintings, stucco, and gilding. The Assumption of the Virgin on the ceiling of the nave is by Baldassare Françeschini, called Il Volterrano (1611-1689), one of the best painters in fresco of his day, and a pupil of Matteo Rosselli (the best colourist of the Revival), and of Giovanni di San Giovanni. The cupola of the tribune is also by him. Twelve frescos along the whole length of the nave, on the wall beneath the ceiling, are by Cosimo Ulivelli (1625-1704), a pupil of Il Volterrano. Before the church was as much decorated as it now is, it was customary to suspend from the roof waxen images of living eminent persons. This privilege was only granted to citizens entitled to the highest magisterial offices, or to foreign sovereigns. The effigy of Lorenzo de' Medici, by Andrea Verocchio, was thus suspended in the dress he wore when he miraculously escaped death from the daggers of the Pazzi. To remove any such effigy was considered the greatest insult and disgrace; and if one fell to the ground it was thought an evil omen. The images of Florentine citizens were hung on one side of the church; those of Popes and foreign potentates on the other. When the SS. Annunziata was altered to please modern taste, these effigies were transferred to the outer cortile, but in the reign of Pietro Leopoldo they were wholly removed. There are few pictures of any importance in this church. The first chapel, to the right of the entrance, contains the last work of Jacopo Chimenti da Empoli (1554-1640). The subject is the Virgin with St. Nicholas and other saints. Jacopo was a diligent copyist of the paintings of Andrea del Sarto, and one of the best masters of his period, which was that of the reformed Florentine School. This picture has, however, been so much meddled with, that it is difficult to recognise the hand of the master. The second chapel has a good altarpiece by Piero Dandini (1646-1712), a Florentine painter of considerable merit, patronised by the Grand-Duke Cosimo III., but negligent in the finishing of his works. In the fifth chapel, on this side, is the tomb of Orlando de' Medici, who lived in the fifteenth century, but was in no way distinguished except having been knighted by the Emperor Frederick III. in the Florentine Cathedral. The monument is, however, a fine example of the sculpture of that period, and is attributed to Simone, by some supposed to have been the brother of Donatello. The sixth chapel contains the grave of the painter Giovanni Stradone; his bust is by his son Scipio. Strada, Stradanus, or Stradone, born at Bruges in 1536, and much employed in Rome, where he worked in conjunction with Daniele da Volterra, was a member of the Florentine Academy, and died in Florence in 1605. The nave is terminated on either side by richly sculptured marble organ galleries, with altars below, the work of Françesco Silvani. In the eastern transept is a chapel containing the tomb of Baccio Bandinelli, the vain, ambitious, feeble rival of Michael Angelo, of whom so many diverting anecdotes are related by Benvenuto Cellini; he was laid here in 1529: the monument was executed by himself; the subject is a Pietà; the Saviour resting in the arms of Nicodemus, whom Bandinelli intended for his own portrait. His profile, and that of his wife, in relief, decorate the frieze to the back of the monument. The tribune is approached from the nave by a lofty arch on either side of which are monuments; that to the right is to the memory of the Senator Donato dell' Antella, and is by Giovan Battista Foggini. Antella, after enjoying his worldly possessions and dignities to advanced life, became a priest, and bestowed all he had on the Servites, with the condition that his money should be expended on the decoration of the church. He died in 1666. The opposite very striking monument was erected to the memory of Angiolo Marzi Medici, and is the work of Françesco di San Gallo. Angiolo Marzi was a notary of San Gemignanao, and began his career as secretary to Piero Soderini, Gonfalonier of the Republic. Accommodating his views to the times, he became a faithful adherent of the Medici faction, when Soderini was expelled in 1512; and he accompanied Cardinal Giulio de' Medici when he assumed the tiara as Clement VII. Marzi was afterwards appointed Secretary to Duke Alexander, and still later to Cosimo I., who allowed him to add the name of Medici to his own, and to adopt the Medici balls in his coat of arms. He is here represented in the dress of a bishop, with a mitre on his head, and reclining on a couch. He died in 1546, and his remains repose beneath this monument. The tribune, or choir, is circular, and surrounded by chapels. The cupola above was built about the middle of the fifteenth century, after a design by Leon Battista Alberti, and at the expense of Luigi Gonzaga, Marquis of Mantua, surnamed the Turk, who reigned from 1444 to 1478. He was one of the first generals in Europe, but was still more celebrated for his taste in the fine arts, and for his patronage of artists at his court. The high altar in the centre of the choir, or tribune, is raised several steps, and has a splendid ciborio – pyx – carved in wood by Baccio d' Agnolo, 1543. Baccio also executed the intarsiatura, or wood mosaic, of the choir. Immediately behind the altar is the Capella del Soccorso, where lie the remains of Giovan Bologna. He selected this place himself, and decorated it at his own expense, with the intention that any Fleming rendering good service to sculpture or architecture, might likewise be buried here. The altar-piece of the chapel, the Resurrection of our Lord, is by Domenico Cresti (1558-1638), called Passignano, from his birthplace, near Florence. The Crucifix and bronze reliefs were executed by pupils of Giovan Bologna, under his directions. The two small statues of Active and Contemplative Life are by Francavilla, the French artist, who made the statues on the bridge of the SS. Trinità. The frescos on the vaulted ceiling, which are nearly effaced, are by Bernardo Pocetti. In the adjoining chapel is a good altar-piece by Angelo Bronzino, representing the Resurrection. The next chapel contains a painting attributed to Perugino, but more probably by one of his pupils; the Virgin is seated on a throne, surrounded by four saints; it is much injured by restorations. The cloister and sacristy are approached through the western transept. The latter is a handsome apartment; the marble frame round the door, within the room is delicately sculptured in the style of Benedetto da Majano. Descending the nave to the left of the high altar, the fifth chapel from the entrance, on this side, contains an altar-piece by Perugino (1446-1524), representing an Assumption of the Virgin. The contemporaries of Perugino accused him of repeating his early pictures in his later works; and he defended himself by maintaining that he only copied what had already obtained the approbation of the public; his reputation, however, suffered in consequence, and he quitted Florence to return to Perugia. Giannicolo Manni, his pupil, is said to have painted a great part of this picture. The fourth chapel – Capella del SS. Crocifisso – has an altar-piece by Stradone, which is esteemed his finest work. In the third chapel is a copy of Michael Angelo's Last Judgment, by Alessandro Allori (1533-1607). Alessandro was the father of the more celebrated Cristofano. The head, seen above the body covered with a white sheet, is supposed to be a portrait of Michael Angelo. The last chapel is called the Chapel of the Annunciation. It was constructed by Piero, son of Lorenzo the Magnificent, after a design by Michelozzi, and contains the so-called miraculous painting of the Annunciation, attributed by some to a certain Bartolommeo, by others supposed to be by Pietro Cavallini, the disciple of Giotto, who practised the art of mosaic as well as painting. Vasari states that Cavallini was born at Rome in 1279, and died in 1364; but others assign an earlier date to this artist, and believe him to have been the architect of Edward the Confessor's shrine in Westminster Abbey, erected by Henry III., 1269, as well as of the crosses to the memory of Eleanor, Queen of Edward I. There is a repetition of this picture of the Annunciation, also by Pietro Cavallini, in the Church of San Marco; but that belonging to the SS. Annunziata is said to have been finished by an angelic hand, when the artist had fallen asleep and dreamt that he was unworthy to paint the mother of our Lord. This picture is considered so sacred that it is only exhibited on great festivals of the church, when the crowd of worshippers renders it impossible for any stranger to obtain a glimpse; at all other times it is invisible. The wooden Crucifix in this chapel is by Giuliano di San Gallo, and the marble image of the infant Jesus is by Baccio Bandinelli. The head of the Saviour over the altar is a good work of Andrea del Sarto. The silver lamps and rich decorations, in pietra-dura, or Florentine mosaic, were made at the expense of the Grand-Duke Cosimo I., and of his son, Ferdinand I. Ferdinand is represented in a relief, on his knees, invoking the aid of the Holy Virgin. The Cloister of the SS. Annunziata was built by Simone Pollajuolo, "Il Cronaca," towards the end of the fifteenth century. It is surrounded by frescos, chiefly by Bernardino Barbatelli, called Pocetti, who was born in Florence, 1542. In a lunette over a door in this cloister is Andrea del Sarto's most celebrated work, the Madonna del Sacco, so called from Joseph being represented leaning on a sack of corn. Vasari declares that "for drawing, grace, beauty of colour, liveliness, and relief, no artist had ever approached this fresco," and though this praise appears exaggerated, the work, even in its present ruined state, possesses a simple grandeur and nobleness of conception and execution which has rarely found its equal. Françesco Bocchi, a friend of Giovan Bologna, who wrote a guide to Florence,222 relates that Michael Angelo was such an admirer of this work, as well as of other paintings by Andrea del Sarto, that he observed to Raffaello d' Urbino, "There is a little man (homocetto) in Florence who, if he is employed in works of magnitude, will make you sweat for it – ti farà sudar la fronte;" which observation, however (always granting the high merits of Andrea del Sarto), was, if true, an amusing piece of egotism in the great sculptor, as well as in the writer who recorded it, and must have sprung as much from jealousy for the honour of the city he belonged to, as from any just comparison between Andrea and Raffaelle. The Company of St. Luke, or Confraternity of Artists, which was instituted in 1350, at one time held their meetings in an oratory of the Hospital of Santa Maria Nuova, but in the middle of the sixteenth century they were transferred to a chapel within this cloister. In the small vestibule leading to the chapel is a well-executed crucifix in bronze, and a very sweet low relief of the Madonna and Child, with two angels, by Mino da Fiesole. The ceiling of the chapel is painted in fresco by Luca Giordano, who was born in Naples 1632, and died 1705. Over the altar is a fresco by Vasari – St. Luke painting the Virgin. Three other frescos decorate the walls – The Trinity, by Angelo Bronzino; a Madonna and Saints, by Jacopo Pontormo; and Solomon building the Temple of Jerusalem, by Santi di Tito. Two marble busts, by Montorsoli, the pupil of Michael Angelo, are over the doors of the chapel – one represents the Saviour, the other his own portrait. The statues around are copies from the frescos of the Sistine Chapel in Rome, and are by the pupils of Michael Angelo. The small fresco, in monochrome, above these statues, are by Pocetti. Several celebrated artists are buried beneath this chapel – Jacopo Pontormo, Franciabigio, Benvenuto Cellini, &c. The last buried here was Lorenzo Bartolini, whose graceful works in sculpture are frequently met with in Florence. 217 See Mrs. Jameson's "Monastic Orders." 218 See "Christian Art," Lord Lindsay, vol. i. p. 13. 219 See "Crowe and Cavalcaselle," vol. ii. p. 375. 220 The decree of beatification did not confer the privilege of being invoked as an intercessor and portrayed in the churches; it was merely a declaration that the person so distinguished had passed a holy life, and had been received into bliss – beato, "blessed." 221 See "Crowe and Cavalcaselle," vol. iii. pp. 546-550. 222 "Le Bellezze della Città di Firenze da M. Francesco Bocchi, da M. Giovanni Cinelli ampliate ed accresciute." Firenze: 1677.